How do you not get drawn in by the name of this company? Saving lives seems ... good? So I tried some bars from This Bar Saves Lives, because as you know, I'm on an unending quest to find snack bars I actually like. Like many, the bars tick a bunch of boxes: the bars are all-natural, non-GMO, gluten-free, kosher, Rainforest Alliance certified, etc. As you can probably guess from the name of the company, there is a bit more to it, and for every bar you buy, a packet of life-saving food is donated. So, actually, sorta, the bars save lives. The bars are available in 4 flavors, I was able to try 3. Sadly, the one that sounds the best (Peanut Butter & Jelly!) is the one I wasn't able to find. They are all made with a "Nut and Seed Mix" of almonds, flax seeds, and pumpkin seeds. 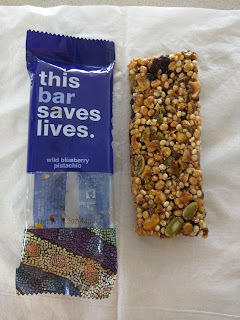 The nuts add a great crunch to all the bars, but, I really can't stand flax seed in general, no matter how subtle it is. 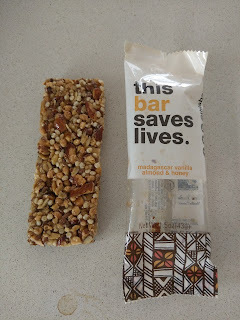 The bars are sweetened with brown rice syrup and agave, nicely a bit sticky, and sweet enough to feel like a treat. All have crispy rice puffs too, again, more crunch that I enjoy. So, a very solid base for all the bars, crispy and a bit gooey, sweet. But, none quite did it for me, due to the flax (and, the cranberries they hid in all of them). As I told Ojan, these were really, really almost good! Dark Chocolate Cherry & Sea Salt. 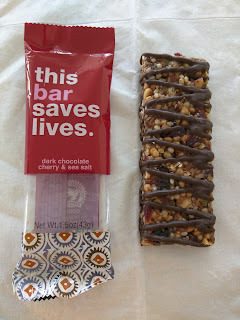 "Packed with crunchy almonds, tart cherries and cranberries, and drizzled with antioxidant rich dark chocolate." The first one I tried was drizzled in dark chocolate. Because, chocolate. But, the real problem, is that I could taste the bitter flax seeds, and I really don't like flax seeds. My second favorite of the flavors though, I do like the dark chocolate. Madagascar Vanilla Almond & Honey. "Perfectly balanced with subtle notes of vanilla and honey, and packed with crunchy almonds and Omega-3 rich flax seeds." Next I went for the most boring sounding one. Again, it had a good base of crispy rice and crunchy nuts, nicely sweetened with agave and brown rice syrup. I really liked the crispy rice, which is so strange, as I usually don't in bars. And I liked the crunchy nuts. And the almost gooey sweetness. But ... again, the slight bitterness from the flax threw me off. This was my least favorite flavor, only because it was so plain. 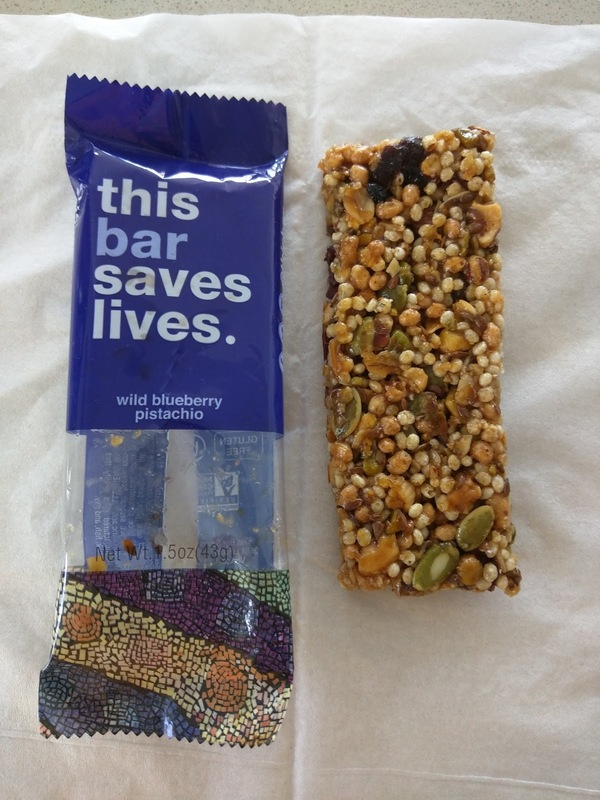 "A delicious and healthy blend of nuts, seeds and antioxidant rich blueberries." And finally, wild blueberry pistachio. This turned out to be my favorite of the bunch, and was almost really quite good. I liked the addition of the pumpkin seeds, and, blueberry and pistachio actually do go together quite nicely, not something I would have expected. But alas, flax seeds and the cranberries made it not enjoyable in the end. By now, you should be familiar with Tout Sweet, the patisserie run by Yigit Pura of Top Chef Just Desserts fame. I've reviewed the signature macaroons (not for me), the cookies (ZOMG, the naughty peanut! ), the breakfast baked goods (not my favorites), and assorted candies (always good to have in my purse), along with a demo or two by Yigit himself. But now we get to my favorite type of baked goods: the "real" desserts Yigit did not disappoint. "Paper-thin crêpe layered with vanilla bean & orange flower water scented custard & brûlée." Yelpers all recommend the Mille-crêpe, and it did look pretty impressive, so I went for it. I was even more impressed when the server pulled out the blow torch to brûlée the top to order, but that aspect was kinda lost once I got it home. I'm not sure if it was ever really crispy or maybe just a bit warm on top? Still, a nice touch. 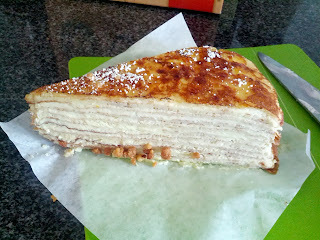 Made from a zillion layers of moist crêpe, with a orange flavored cream between each layer. I don't tend to like orange flavoring, but it was fairly subtle here. But overall, it kinda just seemed like layers of moist soggy pancake. I guess I can see the appeal of this, particularly if paired with a cup of tea perhaps, and maybe for breakfast, not dessert? I wouldn't get it again, and it wasn't really for me. "Caramelized puff pastry, vanilla custard filled eclair puff dipped in crunchy sweet caramel. " 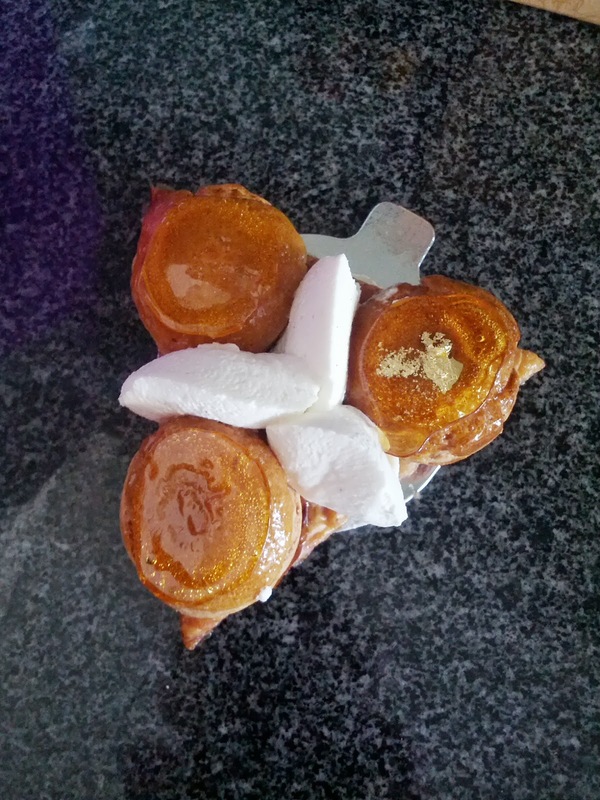 It was made of three vanilla custard filled profiteroles, each dipped in caramel, perched atop a flaky pastry triangle, with some chantilly cream in the middle of it all. Two types of pastry, two types of cream, and caramel? Yes! It was a work of art, and I almost didn't want to cut into it. It was certainly challenging to eat, but every element of it was absolutely delicious. I still have no idea how you were supposed to eat it. Or what Yigit was thinking when he came up with it. But it was awesome. First, the cream puffs. The filling was a standard vanilla custard. The puff was a basic choux pastry. Both good, well executed, but standard. The caramel on top was hardened, a tiny bit bitter, and totally delicious. It was like candy. So good. Why aren't all cream puffs candied? All of this was perched atop a pastry triangle. Buttery and crispy. Perfect pie crust. Did I need pie crust with my cream puffs? Well, no, but, why not? And speaking of why not, the middle was vanilla chantilly cream. Sweet, fluffy, also delicious. So basically, you had cream puffs. You had some of the best parts of pie (crust and whipped cream). And you had caramel candy. All in one. It made no sense. But it totally worked. My second favorite of the desserts, and I'd get it again. Honey Caramel & Triple Nut Tart With Fleur De Sel. $5.50. Since I wanted to try as many things as possible, in addition to the treats I was planning to eat immediately, I was also looking for something that I could take home and eat the next day (if I could resist that long ...). I asked for some advice on what would keep, knowing that many of the pastries and treats would suffer from being a day old. The woman helping me recommended the macarons, but I've never liked those, the cookies, also not really what I tend to go for, or this tart. I opted for an amazing Naughty Peanut cookie and this tart. 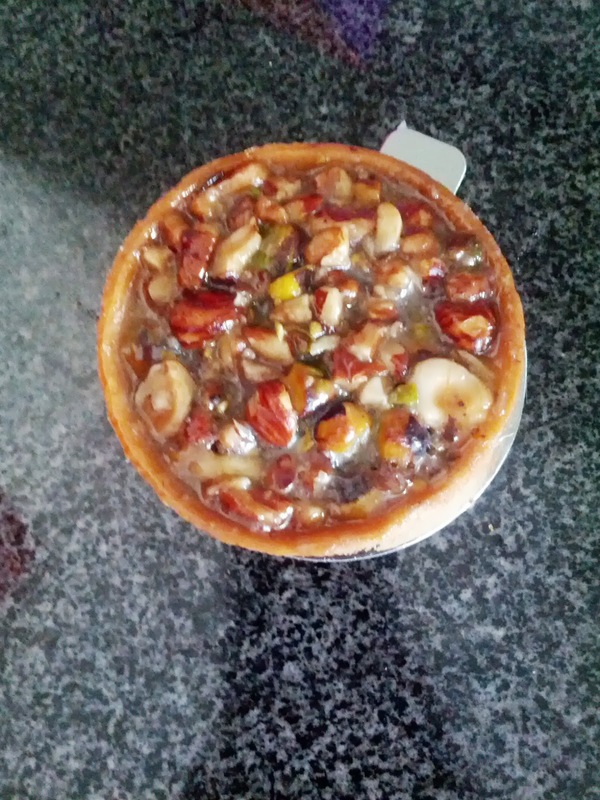 I was a bit skeptical about the tart, since the mix of nuts was pistachio, hazelnut, and pecans. I love pecans, I like hazelnuts, but I often dislike pistachios. I also don't tend to like tarts, as the shells are usually those pre-baked hard tasteless things. And, I'm in love with my mom's pecan pie, and almost all other attempts at anything similar let me down (except for the brown sugar chocolate nut pie from Flour & Co, made with pecans, cashews, and almonds, which is just mid-blowingly good). It turns out, I had nothing to fear. This was delicious, and my top dessert pick. The nuts were a good mix, chopped up slightly but left in large chunks to really enjoy the crunch. They were held together by the caramel, made from orange blossom honey. It was ooey-gooey in a fantastic sticky way, but not cloyingly sweet like a classic corn syrup based nut pie. It put my mom's pecan pie to shame. Why doesn't everyone make their nut pies with honey caramel instead of corn syrup? Such a more delicate, sophisticated, absolutely beautiful flavor. And finally, the tart shell. It was somewhere between a regular tart shell and a pie crust. It was still hard like a tart shell, but had some flaky butteryness to it like a pie crust. A major improvement. I really, really enjoyed this pie. And since I brought it home, I was able to add on some garnish: whipped cream. Maybe that is just me, but I always eat my pecan pie with whipped cream or ice cream, and I wanted it with this too. It did indeed keep fine for a day, when I ate half of it. I kept the other half a day longer, and it got a bit hard. So I decided to try warming it a little. I know most people don't eat pecan pie warm, but I sometimes really like to do that with my mom's pie, and I figured this would work too. And of course, if the pie is warm, it needs cold ice cream to go with it. I only walked away from the toaster oven for what I thought was a few minutes, but either more time elapsed than I realized, or the honey filling just didn't hold up to heat well, but I returned to find a crust, a pile of nuts, and a pool of honey. Whoops! It still tasted great, but was totally a mess. No fear, I busted out the vanilla ice cream and just dumped it all on top. It was actually really, really delicious this way. A warm honey and nut topping drizzled over ice cream, with a bit of pie crust for some crunch? No complaints here. As I said, my favorite dessert item, and I'll totally get another one of these, and of course I recommend it as a good take-home treat for the next day (along with an extra dozen Naughty Peanut cookies to stash in your freezer of course). I was so excited when I saw the verrines on the online menu. So many different fancy layered puddings. And I love puddings! Unfortunately, they only had one available, the Maui. It is the one I wouldn't have picked, as I don't tend to like passion fruit flavor (I love real passion fruit though). But, I was there, and I wanted to try one, so I still went for it. I figured the tapioca layer would at least be delicious, even if I didn't like the passion fruit. Sadly, I didn't like any of it. 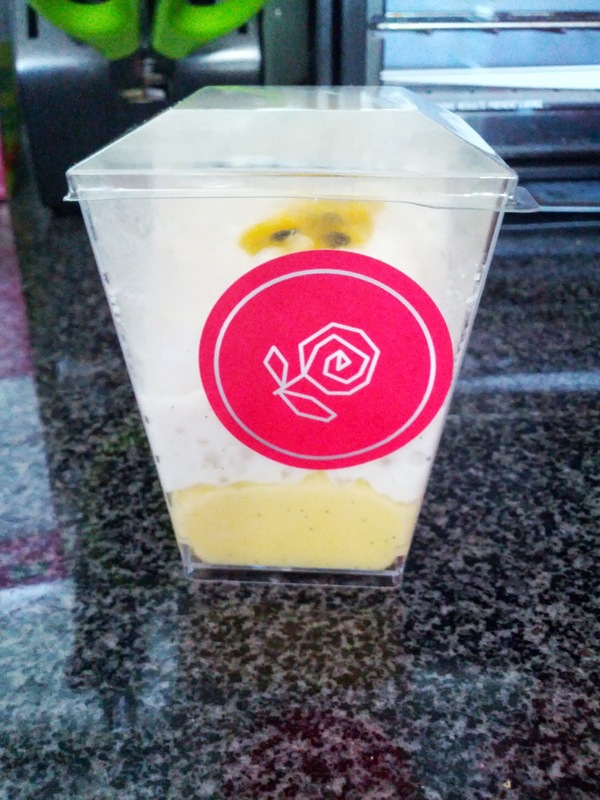 The passion fruit was indeed too strong and sweet for me, and strangely eggy. Like a custard that didn't go quite right. The tapioca layer was strangely grainy. Not a winner, and I only tried a few bites, before passing it off to Ojan. And finally, a few months later, I attended an event catered by Tout Sweet, with a bunch of mini desserts. I recognized the cream puffs instantly, from the St. Honoré. I was fairly certain the treats were from Tout Sweet, and the moment I bit into the cream puff I was absolutely certain. It was far too good to be from a random caterer, and, who else dips their cream puffs in caramel? The crispy caramel disk on top was just too unique to possibly be from anywhere else. I enjoyed the cream puff again, but, I must say, they are far tastier when part of the composed St. Honoré, rather than standalone, as I don't actually just love cream puffs on their own. The hard caramel on top again was the best part to me. 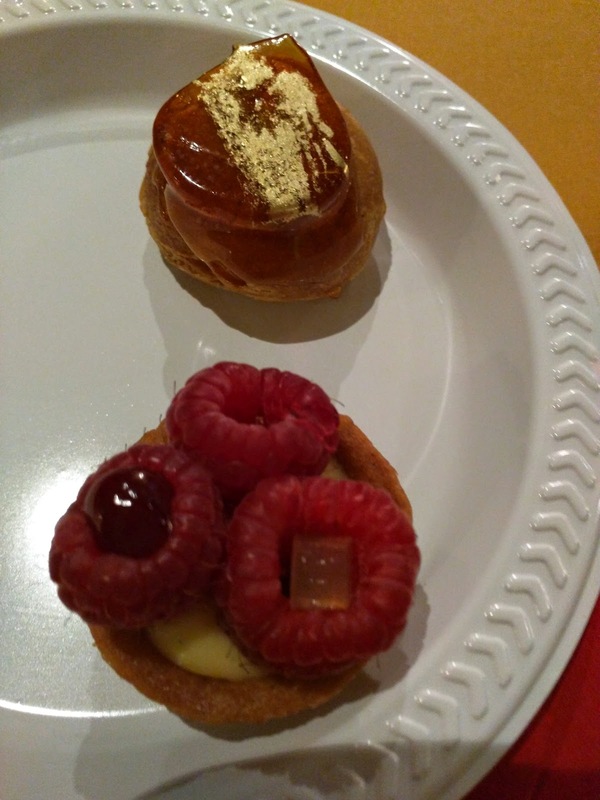 The other item was a little tart, filled with vanilla pastry cream, topped with raspberries, each of which had a tiny cube of something sweet inside. The tarts looked unremarkable, but were really quite fantastic. Little, hard style tart shells are usually one of my least favorite things, always such a disappointment, but these were fantastic! Crisp, buttery, and almost reminded me of pie crust rather than tart shell. The vanilla pastry cream was the same from the cream puff, and the fruit, even though out of season, was fairly fresh tasting. The attention to detail of stuffing each raspberry with a little cube was impressive. Last week, as part of my Waffling Leftovers series, I discussed waffling leftover mashed potatoes. 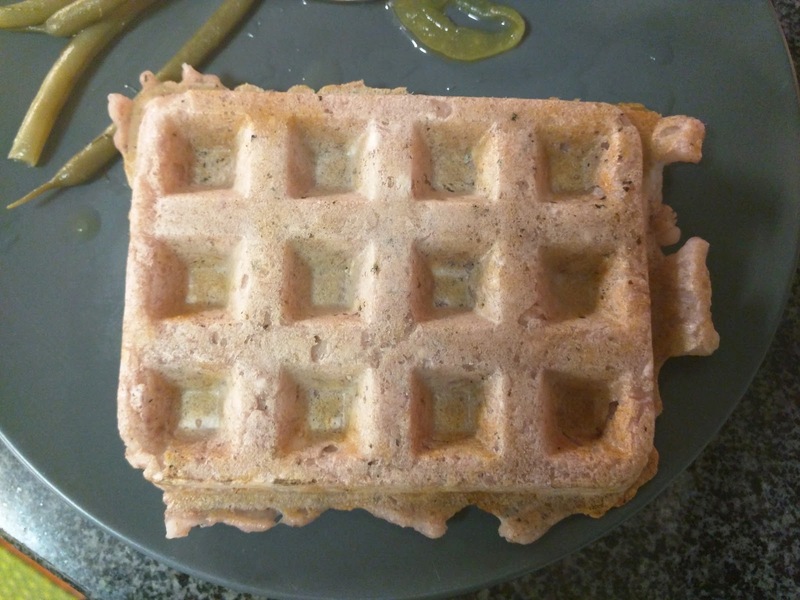 We discovered, that yes, leftover mashed potatoes (and potato puree) do waffle ok, although not my greatest succcesses. 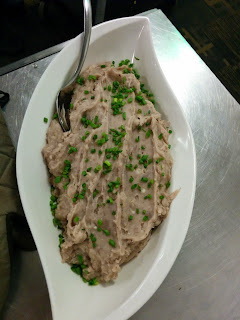 This week, I tried something similar: leftover mashed taro. I expected similar results to the potatoes, but actually, taro worked much better. One of my best discoveries, even better than waffled leftover pizza (although that remains the favorite of both Ojan and my mom), and just marginally less awesome than leftover cheesy grits. 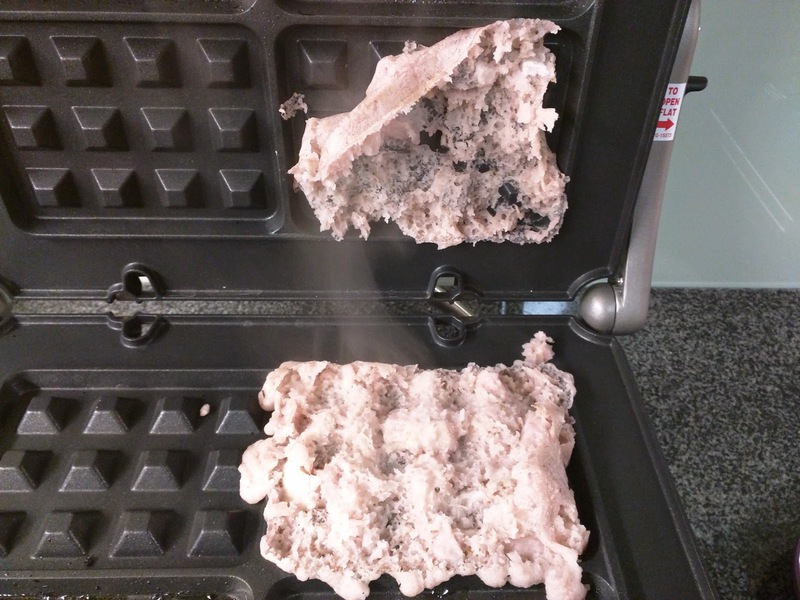 So, leftover mashed taro: Will it waffle? ZOMG yes. The original version was served warm, traditionally. I adore taro, and this was fantastic. Some chunks were left in, which I liked for a bit of texture, but it was still fairly creamy. I think lots of oil was added. Really amazing in its original form. So I kept leftovers. 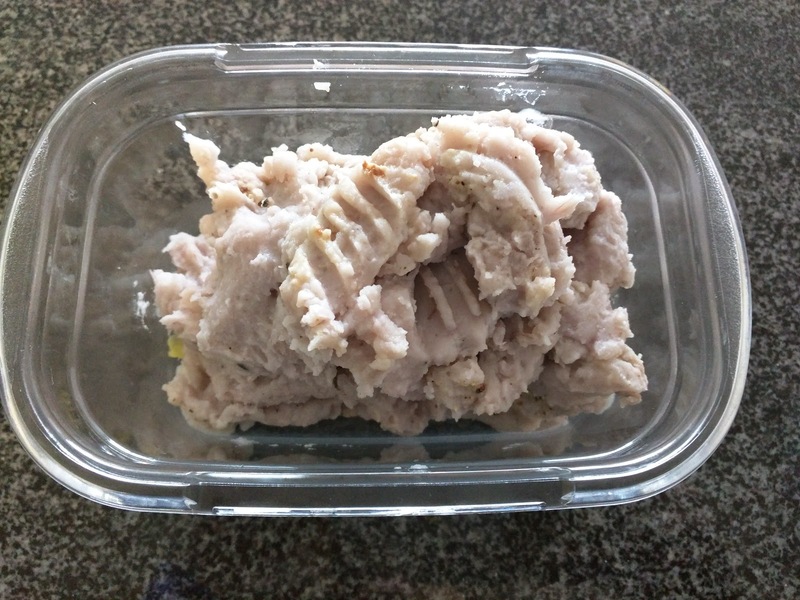 For my experiments, I started with a container full of cold, lumpy, sad looking mashed taro. No different than leftover mashed potatoes, besides the lovely purple hue. 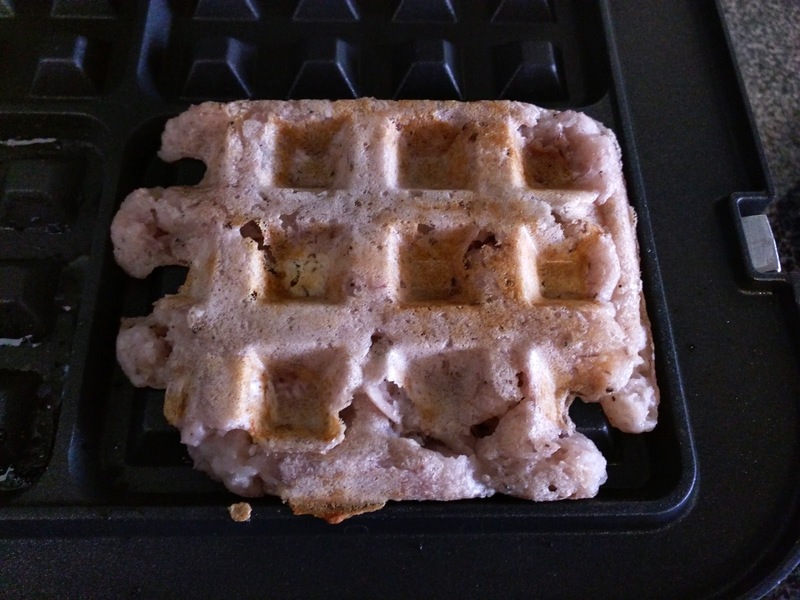 I plopped some into the waffle iron, set for 350 degrees. No modifications, no crusting. I lifted the lid gingerly, and found it completely falling apart. Doh! I started scheming about what I'd crust the next version in, but left this one going a little longer, finger crossed that time would just fix it. And a few minutes later, when I peeked again, it looked like a waffle. Yes! In general, I've found that if you just trust it to release and come together, it will. (Although, clearly, this is not always the case, and you can wind up with a burnt mess if you take it too far). This came out ... perfect. Note to self: 350 degrees setting, ~6 minutes. The outside was crispy, like the most perfect potato pancake or hash browns. It didn't burn at all, it just turned a bit golden brown. I intentionally made the patty extra thick, so the inside would stay soft and creamy, and indeed it did. I love taro in any way, and mashed taro is comforting and delicious in its own right, but this was even better than the original. Major success. 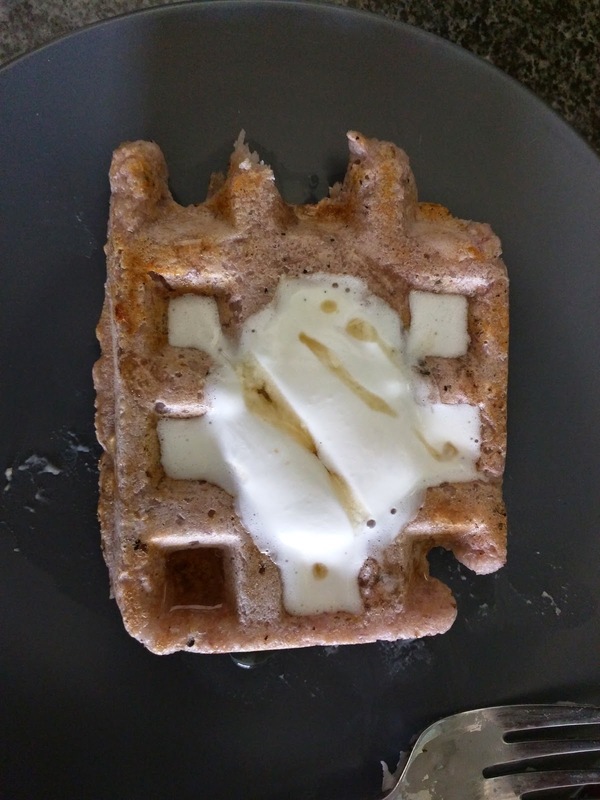 Because I couldn't resist, and I had more left to play with, I turned my next version into dessert, and added a dollop of whipped cream (which promptly melted) and a drizzle of maple syrup for sweetness. They were tasty additions, but not actually necessary in any way. It was great plain, and a savory take with a dollop of crème fraîche (and a scoop of caviar?) would have also worked wonderfully. So many possibilities. Zaarly is a company that has pivoted many times. Currently, they help connect handymen and housecleaners with customers. But before that, they provided a fairly generic online storefront for entrepreneurs, including artists, jewelers, and, my interests: gourmet food providers and bakeries. Before the pivot away from offering food stuffs, I was able to try out several vendors, one of which was Leslie Kay Ho Bakery. You know me, I love all baked goods and desserts, but these sounded extra creative, and I was really excited to try them. Unfortunately, I didn't actually like any that I tried, and further unfortunately, I don't think this vendor is in business any longer, as I can't find any recent information on her storefront. Coconut Mochi Cake with Red Bean Filling. 2 for $7. This sounded great! I love mochi, and the baker told me this was her best seller. It didn't look like anything I'd ever had called "mochi" before, but I figured I'd give this a shot, and purchased a 2-pack, highly anticipating liking it. And ... I really didn't like it. I didn't really get any mochi-like flavor, I didn't detect any rice-y taste. The cake layers didn't have a firm, glutinous texture that I associate with mochi either. What was the mochi aspect of this? 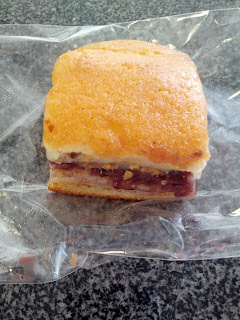 The red bean filling was fine. But overall, it was just kinda soggy, and not quite as advertised. 2 for $7 also seemed a bit pricey. Would not get again. Sweet Potato Haupia Pie with Macadamia Crust. "Our unique pie is made with Japanese purple sweet potatoes, which create a incredibly smooth and tasty filling. The crust is made with macadamia nuts, adding the perfect crumbly texture to balance the filling. The pie is topped with haupia, a traditional hawaiian dessert made with coconut milk. " This sounded amazing! All components I really like (purple sweet potatoes, macadamias, crumble, haupia ...). But, it somehow didn't have much flavor. I really wanted to taste the purple potato, and didn't. I really wanted to taste the macadamia, and didn't. Disappointing.